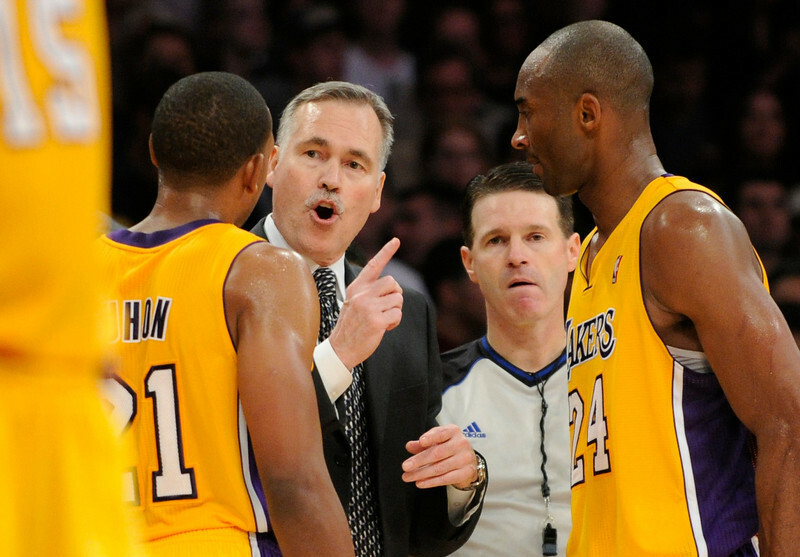 After overseeing the Lakers finish with their worst record in L.A. franchise history and lacking support from Kobe Bryant, Mike D’Antoni resigned as the Lakers coach on Thursday, according to his agent, Warren Legarie. Legarie said D’Antoni reached an “insurmountable impasse” after the Lakers failed to provide assurances that they would exercise his team option that would ensure he would finish out the two years on his contract. He was owed a guaranteed $4 million for the 2014-15 season, while the Lakers held a team option for the 2015-16 campaign. Los Angeles Lakers head coach Mike D’Antoni during a press conference held at the Toyota Sports Center, El Segundo Calif., Friday, April 18, 2014. 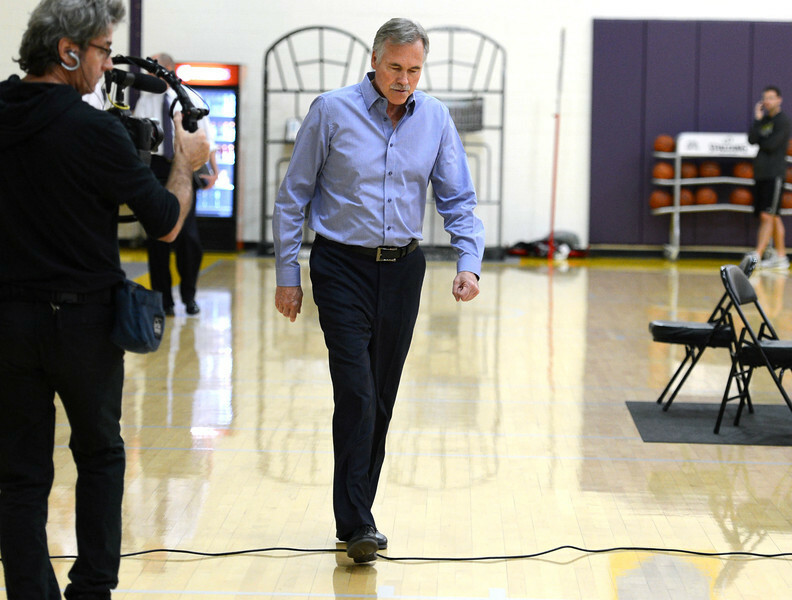 Mike D’Antoni plans to continue having discussions with the Lakers on Thursday, including whether he will coach for the 2014-15 season, according to a league source familiar with the situation. D’Antoni currently plans to speak with Lakers general manager Mitch Kupchak on Thursday over the phone, as opposed to in person. This newspaper also learned that D’Antoni also had preliminary talk with Kupchak late Wednesday afternoon. 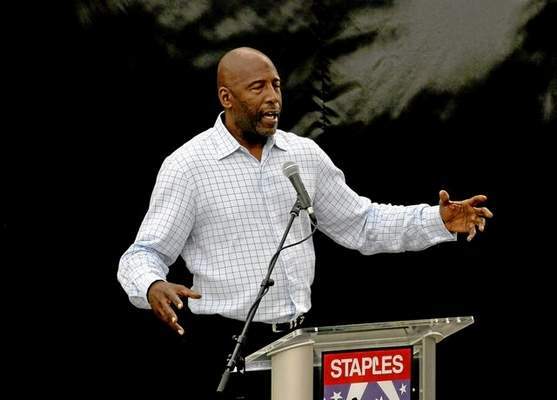 It turns out James Worthy’s contributions to the Lakers’ history will go beyond helping them win three NBA championships. Worthy will also represent the Lakers at NBA draft lottery on May 20. The Lakers had considered sending president Jeanie Buss after representing the organization the last time it was in the lottery in 2005. The Lakers also thought of general manager Mitch Kupchak. But the Lakers decided on Worthy, who was the Lakers’ last top overall pick during the 1982 draft. Worthy is currently an analyst for Time Warner Cable SportsNet, the Lakers’ broadcast partner. The Lakers currently are slated to have the sixth pick of the NBA Draft on June 26. But they have a 6.3 percent chance of winning the top spot at the lottery in New York. The common thread that tie Bill Bertka, Don Ford, Brian Shaw and Jamaal Wilkes involve two things. All have served in various capacities with the Lakers. All will be among the 21 inductees into the Santa Barbara Basketball Court of Champions on June 1, an inaugural event aimed to honor individuals from the Santa Barbara community that made significant contributions to basketball. All four candidates provided that job description in various ways. Bertka, the team’s current special assistant to the general manager for the past 11 years, has worked 33 seasons with the Lakers with various roles as a scout, director of player personnel and an assistant coach on the staffs ranging from Pat Riley, Mike Dunleavy, Randy Pfund, Magic Johnson, Del Harris, Kurt Rambis and Phil Jackson. 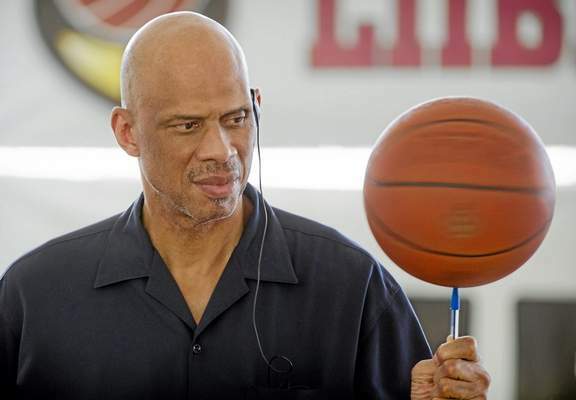 Wilkes played eight of his 12 NBA seasons with the Lakers, helping them to NBA titles in (1980, 1982, 1985). An unnamed UCLA engineering student first called him “Silk” during his sophomore season to describe his smooth style. The late Chick Hearn, the famed Lakers announcer, called Wilkes “the 20-foot layup” because of his consistent shot. He averaged 18.4 points, 5.4 rebounds and 2.6 assists while wearing the purple and gold despite nursing an unorthodox shooting stroke. Shaw won three NBA championships both as a key reserve (1999-2003) and as an assistant under both Frank Hamblen Jackson (2004-2011). He also served one year as a scout. Ford played for 4 1/2 seasons with the Lakers after being selected in the sixth round of the 1975 NBA Draft. Before he was traded to Cleveland, Ford averaged 7.1 points and 3.8 rebounds through 368 games with the Lakers. Something about the Clippers sparked an emotional chord with the Lakers. This did not involve outrage over the Clippers displaying posters that covered up the Lakers’ championship banners and retired jerseys. This did not entail the Lakers expressing resentment over the Clippers’ superior success. This focused on the reaction surrounding Clippers owner Donald Sterling making racially denigrating comments on an audio tape. 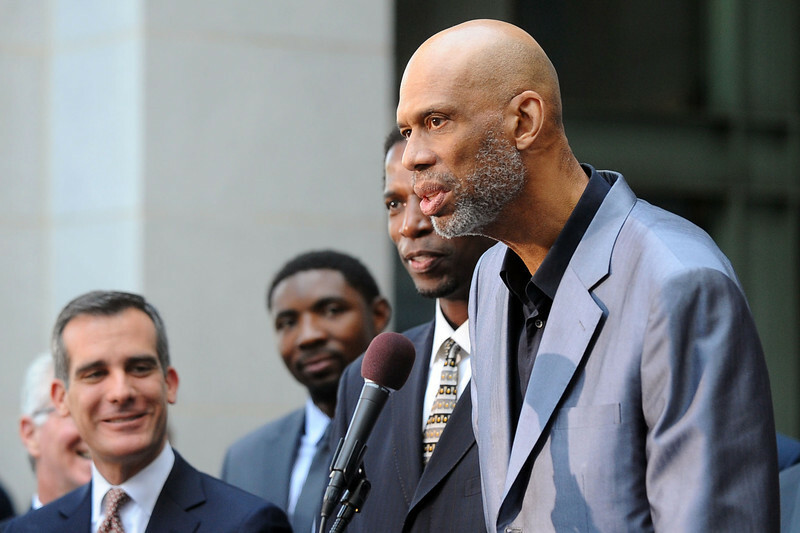 Former Lakers center Kareem Abdul-Jabbar, forward A.C. Green, current guard Steve Nash and former forward Luke Walton represented a handful of both former and current NBA players going to L.A. City Hall on Tuesday to express their support for NBA commissioner Adam Silver punishing Sterling with a life-time ban. 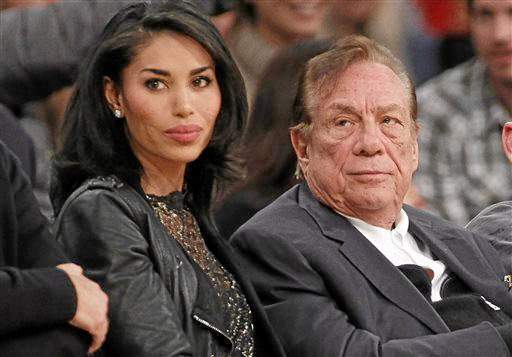 Sterling’s life-time ban means he is barred from attending any Clippers games, including tonight’s Game 5 of their first-round series against the Golden State Warriors at Staples Center. Sterling also cannot go to any practices and has no say in any future business and personnel decisions. Silver also handed Sterling a $2.5 million fine. Silver said three-fourths of the NBA’s owners would have to vote to force Sterling to sell the Clippers. The Lakers never worked with the man on the sideline. But with Hall of Fame basketball coach Jack Ramsay dying in his sleep at age 89 after a long fight with cancer, the Lakers were well aware of the impact he made. Sad day to see my friend Dr. Jack Ramsay pass. Condolences go out to his family & friends. Ramsay is best known for winning the 1977 NBA championship with the Portland Trail Blazers coach. But he had a presence with the Lakers in recent years as a broadcaster for ESPN Radio. Anytime he arrived at the Lakers’ practice facility in El Segundo, players, coaches and staff members greeted Ramsay with warmth and affection. Amid racist statements attributed to Clippers owner Donald Sterling, the Lakers released a statement condemning such words. Amid Clippers owner Donald Sterling purported to have made racially disparaging comments on an audio tape obtained by TMZ, Lakers great Kareem Abdul-Jabbar called him for him to cede his control of the franchise. The persistent losing frustrated Kobe Bryant enough to put public pressure on the Lakers’ front office to rebuild quickly. The occasionally clash between Jim and Jeanie Buss prompted Bryant to call for them to improve their relationship. Philosophical differences with Mike D’Antoni’s fast-paced system and his struggles handling an injury-depleted roster soured Bryant’s outlook on them. But those issues hardly compare to what the Clippers are currently experiencing. Yes, they are the best team in Los Angeles and are currently in the playoffs. 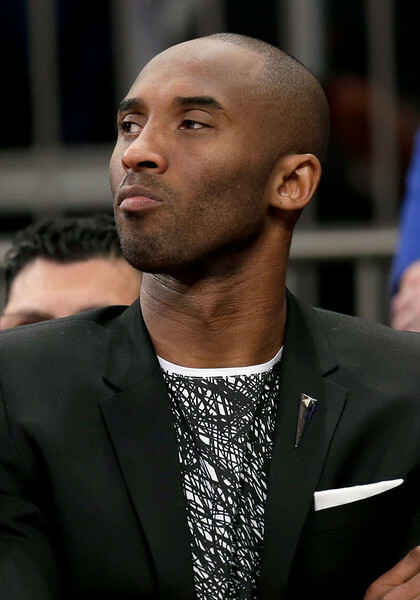 But with Clippers owner Donald Sterling making racially disparaging remarks according to an audio recording obtained by TMZ, Bryant became among one of the many NBA stars speaking out against his words. For Bryant, the incident also provided a bigger reminder that he appreciates what he currently has.